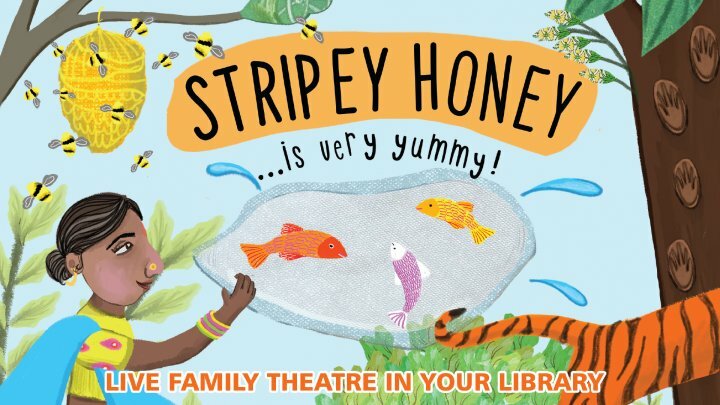 Home › What's On › Events › Stripey Honey... is very yummy! £4 /£10 family (Leicester) - £3 tickets for library members available at the library. Featuring new music, dance and puppetry, Mashi's playful and colourful style takes you on an adventure to the Indian jungle, where tigers and honey bees struggle for survival. "Absolutely exceptional. I brought my 6 year old daughter and she was in fits…. at the same time learning so much. I cannot say how much we loved it." A Big Imaginations commission in partnership with The Spark Arts for Children & support by The Dukes Lancaster. For tickets at Leicester City libraries please follow the links below to book via the library.